I thought we could use a little D/P humor so here it is! Im out catching elekid using the new methods I came up with and in 20 minutes had found 5 elekid! It would have been more if at the ten minute mark the w33bil3st little d3m0n Elekid decided to r33r its ugly head. I wasted all my ultra balls, timer balls, poke balls, premier balls, dusk balls, and was forced to use a frikkin master ball only to find that it didnt even have an electrizer! GRRR! however the one I had coght before did so I couldnt go to my last save point and keep my money/balls/dignity. How embarassing! Location: Delving deep into the darkness of life. I went into Turnback cave and got the end where Giratina is. I got into the fight, whittled down his HP very slowly...finally I got it down to the red, so I pulled out my pack...to find I only had 6 Ultra Balls. It was impossible, to say the least. Just getting a pokemon with the thief skill can solve that problem. That way you wouldn't need to catch the pokemon, just take their item if they have one. Back on topic...I fought an Arcanine with a steel type pokemon, thinking I could win. Er, sorry this is a bit off-topic, but do you know which pokemon has the Thief ability? OMGosh, Theif is a freakin TM! Just test it out on a bunch of pokemon and sooner or later, there's gonna be one that can learn it. As for the specifics, just follow this link and type the word "thief" in the "learns attack" box. Im using an elekid as my lead and I didnt think it could learn thief. i still havent checked. I probrably wont, considering I dont have the TM (I wasted it on luxray, ) anyway, there a lot more frequent, thanks to the static ability. 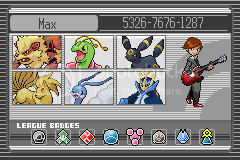 I could switch to luxray, but that would take too long. Anyways, enough bieng off topic, lets discuss your guys screw ups! Looking for an Elekid, only to find out I needed the national dex. And a Spec. Sweeper also need high speed, so Empoleon doesn't really fit the bill. Popular Spec. Sweepers include Alakazam, Gengar, Gardenvoir, Roselia's evolved form, and a few others. Not first post, but it's somewhere there. lost an entire week serching for rotom in the tv and had no idea that i needed the natoinal dex and the very first time after the e4 it was there. I ran into Mesprit and had no pokeballs. Lets see...I was trying to catch a sudowoodo (However ya spell it! Lol) and then instead of using the ultra ball, I accidently used the master ball, and then I forgot to save LOOONG before that and I had accomplished so much too! Lol. I was in Waywerd cave for at least an hour to find that i needed to go under the bridge. I haven't been there myself, but don't you need to go under the bridge to even get to Wayward Cave? at least, that's what i've heard. When I was a little sleepy. I was at the champion for the first time, I had my three strongest left, and she was bringing out Garchomp. My thought process went, ah weak against dragon Go level 51 garchomp! Now he was already out and I had no revives left so I couldn't just switch and risk knocking out my two stronger pokemon. So I completely screwed my Garchomp. It wasn't as damage so much as completely retarded of me. Mine is much more embarassing. I had.....let's see, I can't remember.......oh yeah. I had a Lvl 52 Torterra & I encountered a wild lvl 21 Girafarig. It took out all my PKMN including Torterra. I ran out of Ultra Balls & couldn't catch it, & I couldn't escape for some reason. Go figure. And, this isn't DP, but in my old RBY, I accidently used my Master Ball on one the wild Snorlax. I hadn't saved for hours. I'll catch them all eventually, but until then, this has been decepticlone. Trying to Brick Break a Spiritomb. The "It doesn't affect the foes Spiritomb" text prompted a "OOOHHH...RIGHT! It's a ghost type too!" More of a "What the heck?" moment. For three hours, I restarted, throwing every single ball I had in my inventory until that silly little git managed to uproar my team into submission after using Nasty Plot a few times. Frustrated, I get into battle after reloading, and throw a Quick Ball right away. you dont have to but there is another cave under the bridge that I wouldnt of found if i didnt go insane over a gibel. Trying to catch a wild pokemon while it slowly killed my whole party. I hadn't saved prior. Off topic, I know. Where can I find gible in wayward cave? I started running around the daycare waiting for the old man to cough up my pokemon's egg. Then, after five minutes or so I realized Ditto was the only one in there.